As the 25th NATO summit meeting takes place in Chicago Monday, other world leaders are taking notice at the alliances successes and failures. King Abdullah of Saudi Arabia, held his own summit in the Persian Gulf including the nations of: Bahrain, Kuwait, United Arab Emirates, Qatar, and Oman. King Abdullah's goal is to build a future economic and union security, NPR reports. US and NATO remain undeterred by Russia's threat for a pre-emptive strike against NATO's missile defense emplacement in central Europe. The plan to set up a full missile defense to protect all NATO nations is set to be completely operational by 2020, according to the Christian Science Monitor. After a long weekend of political talks and forming alliances during the G8 and NATO summits, how much was actually accomplished? The Guardian reporter, Ewen MacAskill, takes an indepth look at the outcomes of this years summits. Protesters are standing out front of Boeing's Chicago headquarters to protest the companies conducts in business. The Federal Contractor Misconduct Database talks about how Boeing and Dow Chemical Company are responsible for dumping radioactive waste in a Denver community back in the 90's. STL Today reports that Afghan troops do not feel ready or prepared with the proper equipment to have US and NATO troops leave the nation in 2014. One Afghan solider named, Abdul Karim, stated, "The Americans are giving us old weapons and try to make them look new with polish and paint. We don't want their throwaways." NBC Chicago reports the preparations Boeing took for their employee's in light of today's protest. Although they assume things will go smoothly and peacefully they closed their Chicago headquarters and are having employee's work from home. Exit plans for the war in Afghanistan are ahead of schedule. According to the Morris Daily Herald, world leaders have come to an agreement on an exit plan and will hand over national security to the Afghan people by the summer of 2013. Although US and NATO troops will remain in the country until 2014, their role will be only a supporting role. NATO Secretary General Anders Fogh Rasmussen praises Chicago stating, “Chicago is the perfect place for this NATO summit — Chicago brings many cultures together. It is diverse and dynamic, so Chicago is the perfect place to renew the bonds between Europe and North America,” the Chicago Sun-Times reports. As leaders from all over the world gather in Chicago today, discussions for the withdrawal of troops from Afghanistan will be of major concern. The newly elected French President, Francois Hollande, has promised to pull out France's troops by the end of the year. Meanwhile, President Obama, along with Afghan President, Hamid Karzai, discussed plans for troop withdrawal and re-election in Afghanistan in 2014, the BBC News reports. Taliban issues statement regarding the occupation of Afghanistan. Spokesman for the Taliban, Zabihullah Mujahid, states, "Invaders are utilizing a one step forward, two steps backwards tactic," according to The Christian Science Monitor. With most of the NATO summits leaders being male, women are becoming very concerned that their voices are not being heard. The Christian Science Monitor reports that when NATO and the US leave the nation in 2014, so will all the progress for the Women's Movement for equal rights in Afghanistan. For the third time in history, the Australian Prime Minister will be attending the NATO summit today in Chicago. NATO's operations have spread outside of North American and European nations, peacekeepers from all over the globe are joining the alliance. The Drum Opinion gives interesting insight to the role Australia will be playing in the next few years. As protesters march through the streets of Chciago's Loop district, not all is so peaceful. According to The Washington Post, 19 protesters have been arrested this week so far, not including the three Florida based occupiers that were arrested on terrorist charges. The three men threatened to throw home made bombs at Obama's headquaters, as well as at Mayor Emanuel's house. The Washington Times, reports that the US and NATO's plan to remove troops from Afghanistan will remained unchanged even with France's plan for early withdrawal. France plans on getting out of NATO by the end of this year, almost a full two years earlier than the agreed NATO timeline. Cyber Anarchist group, Anonymous, might be responisble for attacks on City Of Chicago's website. Police are investigating, according to the Chicago Sun-Times. A lawyer's group in Chicago is claiming that police are arresting people in hopes to silence and intimidate protesters at today's and tomorrow's NATO summit meetings. 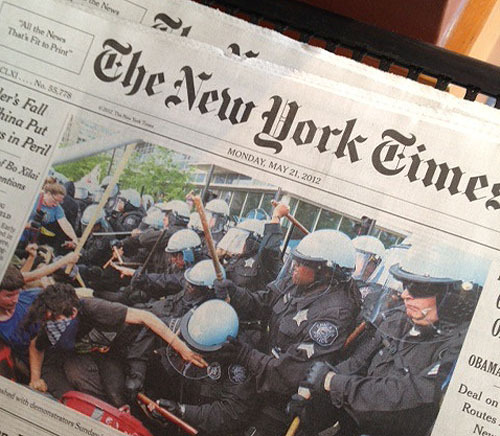 The Chicago Tribune reports false arrests have been made to diminish demonstrations.